We have been telling you for about 2 years now about the Lexus and Toyota cracked and melting dashboard issues and how these car makers have instituted a free extended warranty to cover the repairs for replacement of new dashboards for all the affected models on the approved repair list. We even own a Lexus GX470 SUV ourselves, and we here at CarBuyingTips.com had firsthand knowledge inside the vortex of how this special extended warranty was working. We spent about 4 months on a waiting list in mid-2015 that was only 50 deep when we hopped aboard early in the process at our local Lexus dealer. They finally repaired our dashboard, a $2400 value, and we were very happy as were a number of other Lexus and Toyota owners at the time. It appears that Lexus and Toyota owners who were not on a waiting list when we were by June, 2015, found themselves on very large waiting lists that grew quickly as word spread of the free dashboard repair. By the end of 2015, owners were reporting to us that they were at least 150 on their lists, and the queues were moving slower than molasses, actually more like drying concrete! But then we started to hear from our site visitors and from other owners on Club Lexus, desperately contacting us about extremely long wait in line at the queue at their local Lexus and Toyota dealer. Some people are quite angry, and venting their extreme frustration and anguish to us, reporting that their Lexus dealers with 150 people on their wait list are informing them that they only receive one new dashboard part per month to perform the free repair. You do the math on the wait time. Other visitors have reported that they were over 1,000 on the list, and happy to move up to 794 on the list. That shows you how big this issue really is. 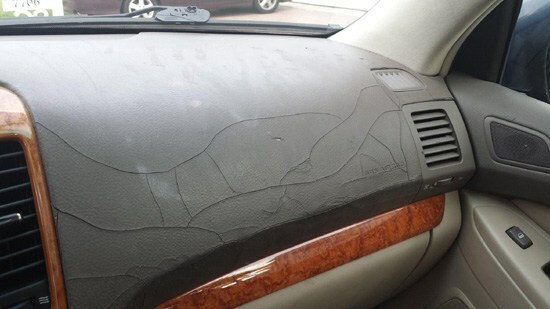 Many owners of these affected vehicles with melted and cracked dashboards complain that that they were told 6 months waiting time, but a year later they are no closer to getting theirs repaired. These desperate owners now 18 months later, they still have no answer, leading to great anger, frustration, and backlash against both Toyota and Lexus. Some frustrated owners have only moved up a few positions on the list and are either being given at least another year waiting time, or given no prediction at all. Read some of these actual stories of anguish below from our web site visitors who inform us of what they are going though, this is like a broken record of anguish and frustration, with no light seen at the end of their long dark tunnels. I have just read your post re the dash issue with Lexus vehicles. I have a 2005 Lexus RX350 that has a severely cracked dash and have been waiting for a replacement for well over 2 YEARS and I am still at the same spot on the waiting list. Not ONE has come in for my model. I have contacted customer service, head office, etc. and no updates. I strongly feel Lexus is only paying lip service to this and has NO intention of replacing these dashes. They are doing nothing to expedite the process. Do you have any suggestions as to what a consumer can do? My guess is that Lexus knows people will eventually give up and get rid of their Lexus beaters, or die waiting. Many of us are seniors and there's no possibility of outliving the wait. Any suggestions?? I am at a total loss and so disappointed. This is my 3rd Lexus and I will NEVER buy another Lexus again! I live in Sarasota and have a 2005 Lexus 330RX with a severely cracked dash. I am having a terrible time with the local Lexus dealership, Wilde of Sarasota. They have been giving contradictory information, now for years. They went from telling us that there was a 3-6 month wait for us. That was over a year ago. They slid on that, got angry when pressed and I filed a BBB complaint. That did nothing. I got Lexus national customer service involved. They did nothing and also rather than doing all to help they simply became irritated and pointedly unhelpful. Not sure what to do. They now tell me I am 40th on the list in my color dash. So based on how they have been treating us that would be another year and a half. I am still waiting for my RX 330 dash board to be replaced by the dealer under the extended warranty. It has been almost 2 years since the Lexus message. Replacement dash boards are trickling a few or none per week. Waiting in frustration! Hope there is a group thrust on Lexus for a quicker solution. Thanks in advance for your suggestions, if any. Thank you for providing such great information to consumers. I took my 2007 Lexus RX350 SUV in to Sterling McCall here in Houston on 1/25/16 per their request to make sure my vehicle qualified for the enhancement for the cracked dash. We were told it could take up to a year for the repairs to occur. Zoom forward 12 months and we followed up only to find that we were #1047 on the list and we have moved up to #794. Isn't there anything that can be done to force Lexus/Toyota to speed up this process? I use my vehicle for Uber and it is so unsightly when anyone sits in the front seat. It could affect my rating – Nona. My 2007 Lexus IS 250 has been on a waiting list to have its dashboard and door panels replaced as part of a recall since 12 November 2015. Originally I was told it would be 2 to 6 months. When I checked in 2 months I was told 6 more months. In June, 2016 I was told October of 2016. Today I was told at least 6 more months. They tell me that they are working as fast as they can. The situation at Mobile AL Lexus is turning out to be scam. It is a phantom list upon which I am "listed" but I moved around on the list which became a merged list for months. Then, you could not be told where you were on the list, just that they are only 2 months into their list. Now, they are just taking photos and documenting your dashboard issue because they will not be getting it done before the end of the recall. I have waited for dashboard repair for RX 350 model 2009 since October 2015, first time I reported to the dealer at Lexus South Atlanta. Regularly I called them for an update but the feedback is they are waiting for the parts ever since. I online chatted with Lexus website and got similar response like diligently working on this issue. I'm fed up with the experience, but how can I further deal with it? Hi. I saw your post about Lexus offering to replace cracking dashes on many models, including the GX470 SUV. I live in Canada and would like to buy a used GX470 that originally came from Texas (US truck according to VIN) but is now in Canada. From what I have been able to find out (Lexus Canada and Lexus USA) the dash replacement warranty only applies to the USA, which I find very frustrating. Have you heard any different in your investigations of this issue? Thank you. I brought my Lexus from Lexus of Cerritos in August, 2007. My service writer wrote up my issue as well as a trunk handle problem. She assured me that they would have my car repaired in 5-7 weeks. They returned my call yesterday to tell me that it looks like about 21 weeks before they have the necessary parts. Just thought I would pass this on to you. One From October, 2015: I just read your article regarding "Lexus Cracked Dash Warranty Repair," I have been on the waiting list since June 2015, they initially told me it'd be 4-6 weeks, every month that I call, they extend that out farther and farther. Today I called and I am number 176 on the list, they are currently servicing number 54 on the list, the dealership receives 4 dashes per week, which means.....I should receive my new dash in about 30 week! It's ridiculous. What horrible service! I am currently working with Park Place Lexus in Plano Texas. I called Lexus Austin, who are ordering only 3 parts per week and would not disclose the wait time, also spoke to Park Place in Grapevine Texas, who are ordering 1 part per week (currently at a 50 week wait time) and a Lexus dealership in Oklahoma City who also can only order 1 part per week and their wait list is to June 2016. It seems ridiculous to pay 50k for an SUV and receive this time of response. I'm just so frustrated! I just read your article about the cracked dashboard on several Lexus'. I just purchased a 2004 Lexus GX470 on yesterday, and I noticed that the dashboard is beginning to crack. As the new owner, will I qualify for the program to get my dashboard warrantied under this program? Please help! I've read about Lexus and Toyota replacing cracked dashboards. 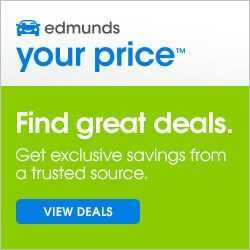 I have a 2008 Acura TL that the dashboard has cracks. I'm concerned about the safety of the airbag deployment. I have also read on the Internet that I am not alone. Thank you for the information on replacement of Lexus dashboard by Toyota. I am a Nigerian living in Nigeria and I bought a Lexus RX 330 (2004) in the U.S but shipped to Nigeria. I just noticed today that the dashboard is cracked and also peeling. I am truly horrified as this is my second Lexus (I still drive the other RX 300 2001 model from time to time). I have all the details of U.S purchase from new and need your advice on how to go about solving this issue. From June, 2015: Jeff, I saw your story about melting dashboards on some Lexus models. I am sure you know this is happening with us poor Toyota Camry owners as well. I got the "warranty enhancement" letter months ago, nothing further from Toyota. I know there is a class action pending somewhere about this issue as well. Can you provide me with any encouraging update as to when Toyota will get off their butts and fix this problem? I live in Florida. Dash is disintegrating in the heat! Thank you for your great article regarding the Lexus GX470 cracked dash warranty enhancement. I have contacted a local dealer in Minneapolis and it seems things are being delayed. They are not being proactive or interested in helping me. I suggested they take my information down or look at my car and start creating an inventory of clients who will require a new dash but they will not do that. The idea is that dealers should quantify the amount of dashes needed. Why wait or guess how many will be needed? We haven't received the second notification letter from Lexus that said "when sufficient parts have been prepared" So how in the world is Lexus going to know how many they will need? It seems they are buying time and delaying things so we forget about it. I would appreciate your comments. Do you know why it is taking on average two years to get the cracked dashboard replaced under the Lexus warranty. If they valued their customers as they say, it should not take that long. Are you getting similar complaints regarding this matter. Thank you for contacting Lexus Customer Satisfaction. Since the announcement of the Customer Support Program, we have been diligently making preparations for the parts replacement phase of this Program. Due to the age, volume, and breadth of the covered vehicles subject to the Program and the size and complexity of dashboard manufacturing, we are launching the part replacement portion of this Program in several phases. Despite our increased production levels of these parts, it is difficult to predict demand and where parts need to be shipped to support the program. Due to these factors there still may be a period of time customers will need to wait before part replacement can be performed. Please know, your dissatisfaction has been documented at Lexus National Headquarters. We apologize for any inconvenience this information may cause. If you require further assistance, please respond to this email, or contact Lexus Customer Satisfaction at 1-800-255-3987, Monday through Friday, 5:00 am to 6:00 pm, or Saturday, 7:00 am to 4:00 pm, Pacific Time. Many owners are so angry and frustrated at what they perceive is either apathy or really bad customer service on the part of Lexus and Toyota dealers. Many are asking about class action lawsuits because the dealers keep pushing back the repair to the point these customers feel they will be after the cutoff date of the extended warranty. Why are the repairs going so slow? Where is the bottleneck? From what we can gather from the car dealers, the new dashboard has to be ordered from the vendor that made them, and with potentially 3 million vehicles involved, there are only about 180 Lexus dealers, and about 1200 Toyota dealers. But the melting dashboard problem has been an issue typically in the southern states and the southeast. This means you have a lot of cars potentially lined up to be repaired concentrated in the southern part of the United States, to a smaller group of dealers. Remember these cars were all built over 6 years' time, and so it takes time for the vendors to tool up and re-build the necessary model year and different colored dashboards for this special warranty repair. What can be done to speed things up? What are my legal options? This is probably equally a nightmare for Lexus and Toyota to pull of this huge feat as it is for the owners growing impatient for repairs who feel like these car makers are backing out on their promise to make these covered repairs. Not much can be done, as even the dealers are waiting to get the new parts in from the vendor. Also, the rollout of repairs is being executed by a pecking order of models because it is easier to tool up for one model, crank out all the new dashboards, then move on to the next model. A class action lawsuit has been filed against Lexus over these melting dashboards. 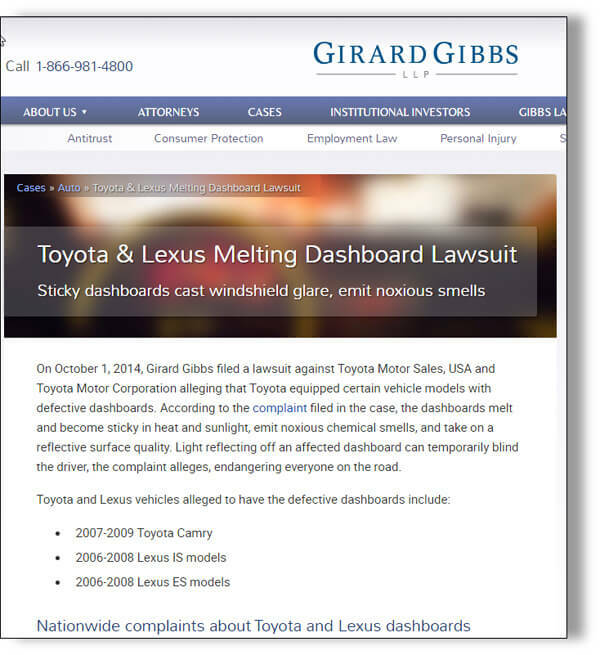 On October 1, 2014, the famous class action law firm Gibbs Law Group filed a lawsuit against Toyota alleging that they built certain models with defective dashboards. The lawsuit describes how the dashboards melt and become sticky in heat and sunlight, and that they emit noxious chemical smells, and become shiny and glaring, causing bad reflections in the windshield, making the cars dangerous to drive for some owners. The bottom line is it looks like everyone is going to just have to make sure you are on a list, and hunker down and ride out the storm. Check your position in line every month with your dealer. You can look into hopping aboard a class action lawsuit, or waste time filing Better Business Bureau complaints, but it still won't affect and improve the logistics timing of new dashboards manufactured any faster from what we can tell. Hopefully after a couple of more years, time will tell if all of you got your melted dashboards repaired.